Energy data from sources such as human motion, wind speeds and light irradiance that could be used to power wireless electronic devices is being made available to the world’s scientific community, thanks to a new resource being launched this month. The Energy Harvesting Open Access Data Repository is an online resource for researchers worldwide to share detailed data on energy availability and characteristics. It will be launched at the annual conference of the Energy Harvesting Network ‘Energy Harvesting 2012’. The Network, which is funded by the Engineering and Physical Sciences Research Council (EPSRC) and managed by the University of Southampton, brings together UK academic and industrial researchers and end-users of energy harvesting technology. Energy harvesting is a means of powering wireless electronic devices by scavenging many low grade ambient energy sources, such as environmental vibrations, human motion, thermal gradients and light, so they can be converted into usable electrical energy. Energy harvesting devices are potentially attractive as replacements for primary batteries in low power wireless sensor nodes. They also hold the possibility of one day enabling the powering of a range of devices not currently possible, including implantable and wearable medical devices. The ‘Energy Harvesting 2012’ event, on Wednesday 28 March in London, provides a platform for disseminating energy-harvesting advances in the UK, and contains presentations from well-respected speakers from academia and industry, demonstrations from companies, and posters from postgraduate students. Registration costs £50 (a subsidised rate of £25 is available for academics), while PhD students that bring and present a poster can attend for free (there are only a few poster spaces left). 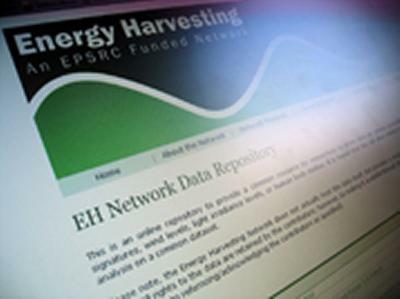 The Energy Harvesting Network is managed by Professor Steve Beeby and Dr Geoff Merrett at the University of Southampton, and launched in March 2010. The Network is funded by the EPSRC, and aims to define new research challenges, facilitate interaction between researchers and industry, and to disseminate latest advancements in technology.